This year, Tax Freedom Day falls on April 19, 109 days into 2018. Tax Freedom Day will be three days earlier than it was in 2017, in large part due to the recent federal tax law, the Tax Cuts and Jobs Act, which significantly lowered federal individual and corporate income taxes. In 2018, Americans will pay $3.4 trillion in federal taxes and $1.8 trillion in state and local taxes, for a total bill of $5.2 trillion, or 30 percent of the nation’s income. 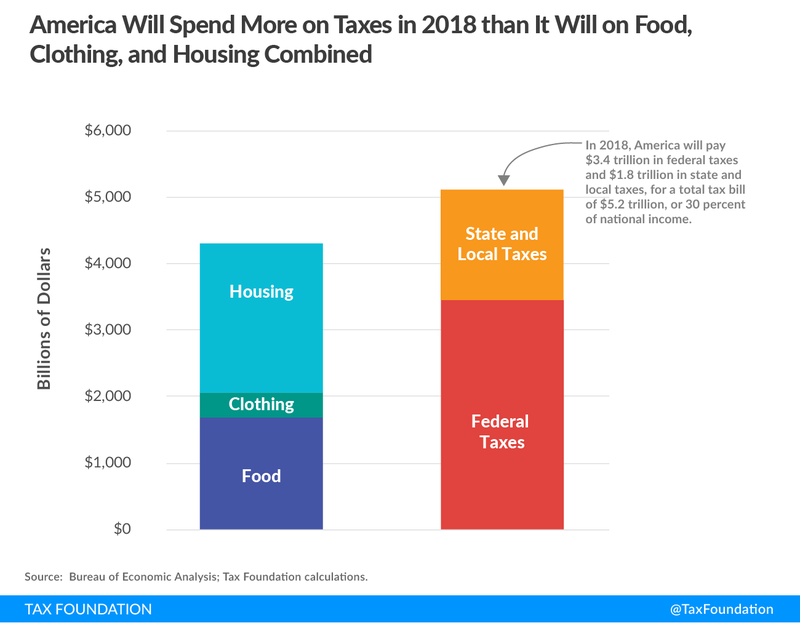 Americans will collectively spend more on taxes in 2018 than they will on food, clothing, and housing combined. If you include annual federal borrowing, which represents future taxes owed, Tax Freedom Day would occur 17 days later, on May 6th. Tax Freedom Day® is the day when the nation as a whole has earned enough money to pay its total tax bill for the year. Tax Freedom Day takes all federal, state, and local taxes and divides them by the nation’s income. In 2018, Americans will pay $3.39 trillion in federal taxes and $1.80 trillion in state and local taxes, for a total tax bill of $5.19 trillion, or 30 percent of national income. This year, Tax Freedom Day falls on April 19th, 109 days into 2018. Since 2002, federal expenses have surpassed federal revenues, with the budget deficit exceeding $1 trillion annually from 2009 to 2012. In calendar year 2018, the deficit is expected to increase from $665 billion to $806 billion. If we include this annual federal borrowing, which represents future taxes owed, Tax Freedom Day would occur 17 days later, on May 6th. 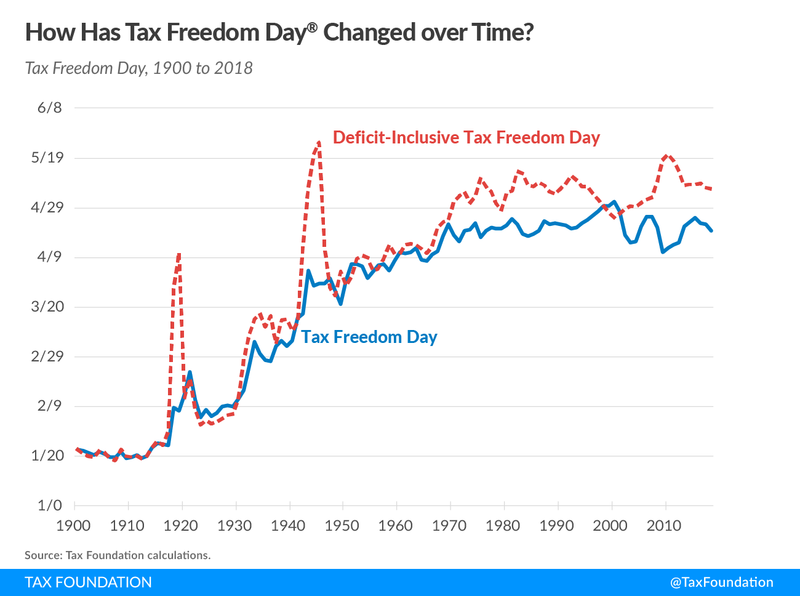 The latest deficit-inclusive Tax Freedom Day occurred during the final year of World War II, on May 25, 1945. The total tax burden borne by residents of different states varies considerably due to differing state tax policies and the progressivity of the federal tax system. This means that states with higher incomes and higher taxes celebrate Tax Freedom Day later: New York (May 14), New Jersey (May 3), and Connecticut (May 3). Residents of Louisiana and Alaska bear the lowest average tax burden in 2018, with Tax Freedom Day having arrived on April 4. Also early were Tennessee, Oklahoma, and Alabama, all on April 5. The latest Tax Freedom Day was May 1, 2000; in that year, Americans paid 33 percent of their total income in taxes. A century earlier, in 1900, Americans paid only 5.9 percent of their income in taxes, meaning that Tax Freedom Day came on January 22. In 2018, Tax Freedom Day will be three days earlier than last year’s date, April 22nd, 2017. 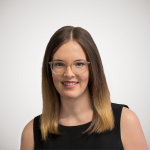 This shift is largely due to the recent federal tax law, which significantly lowered federal individual and corporate income taxes. In the denominator, we count every dollar that is officially part of net national income according to the Department of Commerce’s Bureau of Economic Analysis. In the numerator, we count every payment to the government that is officially considered a tax. Taxes at all levels of government – federal, state, and local – are included in the calculation. In calculating Tax Freedom Day for each state, we look at taxes borne by residents of that state, whether paid to the federal government, their own state or local governments, or governments of other states. Where possible, we allocate tax burdens to each taxpayer’s state of residence. Leap days are excluded, to allow comparison across years, and any fraction of a day is rounded up to the next calendar day. For 2018, the methodology for calculating each state’s Tax Freedom Day has been updated significantly. 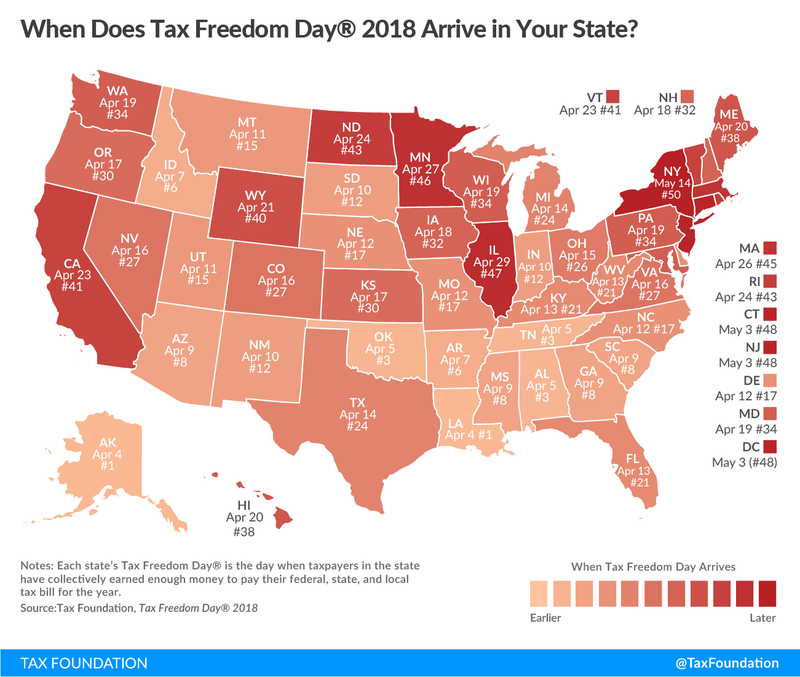 As a result, the date of Tax Freedom Day for each state in 2018 is not strictly comparable to the date of Tax Freedom Day for states in previous years. In addition, calculations of the date of Tax Freedom Day for states in 2018 may not take full account of the secondary effects of the recently passed federal tax bill on state and local tax collections.